As a dancer, the language Terri understands best is movement. From the beginning the dance of TriYoga spoke deeply to her and it soon became her life. She says, “When I took my first TriYoga class to help with meditation, I immediately fell in love with the flow.” She has been certified to teach since September 2000 and is grateful for the ability to share TriYoga with others. 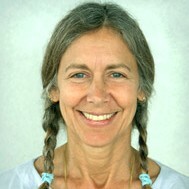 A senior-level TrIYoga teacher and teacher trainer, Tarini teaches regularly in Santa Cruz and international locations. Her daughter, Kara, also a TriYoga teacher, takes classes to complement her career in music, theater and dance.